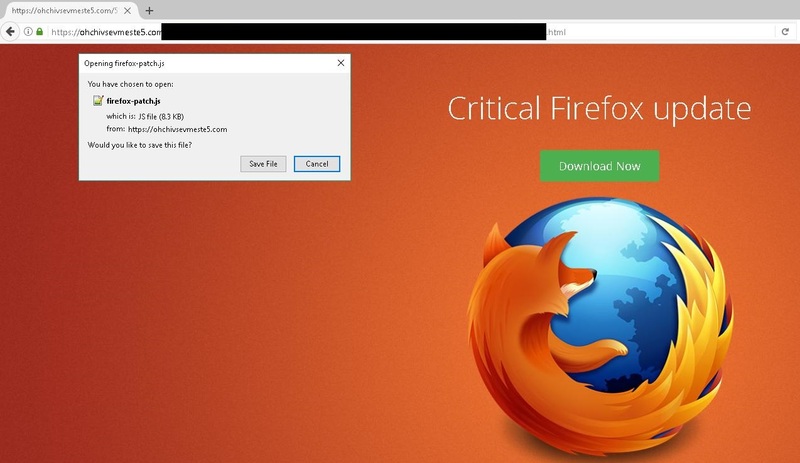 Malicious ad/click networks: common or forgotten threat? Malicious ad/click networks and ad fraud are not entirely a new phenomenon, but it is important to realize the kind of threat it may pose. Is it a common, or forgotten threat? Maybe both. In this blog post, we'll take a look at how a seemingly innocuous click network and advertiser, is actually showing some rather malicious behavior. Basically, what you see is not what you get. In this case, a Firefox update is anything but said update. The domain mentioned in figure 2 is hosted on 192.129.215[. ]157, which has a ton of other domains, with most of them appearing random. One of these domains is aiwohblackhatx[. ]org, which is registered to a person with email address of abdelrahman.a.y.127@gmail[.]com. Until recently, that page listed a contact email address as ADMIN@ULTIMATECLIXX[.]COM. This has now been changed, and unfortunately I was unable to take a screen capture at that time. This initially lead me to believe that Abdelrahman and Mohammed are the same person, and is simply an alias. However, WhoIs data from another domain, aifomtomyam69[. ]org, reveals a person named 'Abdelrahman Farajallah' as domain owner. Brothers or not, it seems that Mohammed is the 'public face' of the company, and Abdelrahman works in the background, registering domains. A well-oiled business scheme, apparently. This was posted in 2015 on the eMoneySpace forum, which is a website created to 'promote or talk about internet money related subjects'. Basically, how to earn money online using ads, which is completely legal. You may have noticed vahfebankofamerica[. ]net in there, it is relatively newly registered (2017-09-12), by a 'Megan Quinn', with email address of qum65@binkmail[.]com. I doubt an actual Ms. Quinn would use this email address. It may try to convince users of its legitimacy, alluding it is part of Bank of America's website. However, nothing could be further from the truth. No doubt this website would also prompt you to download a 'critical security update'. Do I hear redirects mixed with ad or click-fraud and clickjacking? Who doesn't love the smell of that in the morning? Everything in the WhoIs info is fake. Not to say an Allan Yates doesn't exist, but he has nothing to do with any of this - rather he was just unlucky. This may have been the result of a 'fake name generator'. We now have several IP's hosting a bunch of semi-random domains, set up for redirects, ads and likely clickjacking. The initial research started with 192.129.215[. ]157, and expanded to/had links to 192.129.215[.]155. Of course, I decided to take a look at 192.129.215[.]156. Surprise! It turns out it's just as bad. Maybe we should just block the whole 192.129.215.0/24 subnet? A valid SSL cert, issued by Comodo. Earlier, Mohammed boasted in his forum post about adzbazar.com, one of his new websites, and absolutely 'no ponzi scheme strategy'. I think you can start seeing a pattern here. Earn money by completing simple tasks online. Everyone can join, it’s absolutely FREE! The topic on gptplanet also references to eMoneySpace, a forum mentioned earlier, and specifically, several topics are set up about 'referral' websites our dear friend Mohammed has set up. It comes to my realize for a whole year now, is that some people are implementing some malicious scripts onto their advertised ad for a user to click on it. There is also mention of another person, 'Agony'. This nickname may refer to Abdelrahman. Install a 'well-rounded' ad-blocker, for example uBlock Origin (works with most browsers). And, where possible, browse the internet with caution. Note that the campaign on 192.129.215[. ]157 remains highly active, and as such, it is recommended to block or blacklist it, as well as the other domains and IPs, provided at the end of this blog post. When you get a prompt for download or running a 'Firefox patch' similar to above, or any other pop-ups for that matter - where you not instantiated a download yourself - cancel the download or, if not possible, kill your browser's process. This can be done via Task Manager for example. Additionally, you may check in your firewall or proxy logs, if there was any connection at some point with any of the domains or IPs provided in the Indicators Of Compromise section below. The ad network is malicious in itself. Probably, at some point, there should be better security controls for ad networks, in order to prevent an attack or campaign such as the one described in this blog post. Proper security hygiene is necessary for the ad networks, but just as well for any website that serves up ads. Clickjacking and click-fraud is a common and a very real threat. Are you watching your logs, and acting on them?